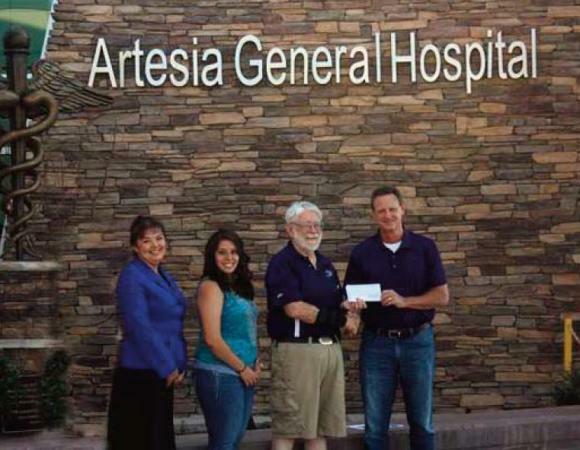 Bob O’Brien, far right, plant manager with HollyFrontier/Navajo Refining Co., presents a check in the amount of $12,500 this morning to Joe Schiel, fund overseer, to benefit the New Mexico Community Foundation Artesia General Hospital Fund. The endowment, created eight years ago by Schiel and Chip Camp, serves as an educational fund for hospital employees. Corey Yates, assistant CFL, far left, and Mireya Hernandez, former CNA and current student, second from left, were two of the four recipients of $6,000 in scholarship money this year. Anyone wishing to donate may do so via the following address: New Mexico Community Foundation Artesia General Hospital Fund, P.O. Box 628, Artesia, N.M., 88211-0628.